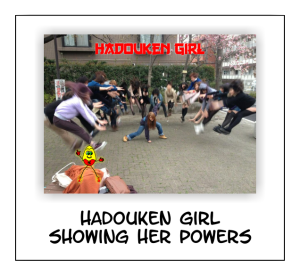 The latest photo trend, or internet meme to hit the world in the past few days is “Hadouken-ing” and it is coming straight from Japanese schoolgirls. They are taking photos with their friends throwing energy waves and doing power moves from the game “Street Fighter” and various Japanese anime series like “Dragon Ball Z”. The photographs typically show one person striking the ground or making a mystical gesture while others around them are photographed as if flying in mid-air. These pictures are also known as “Makankosappo”. 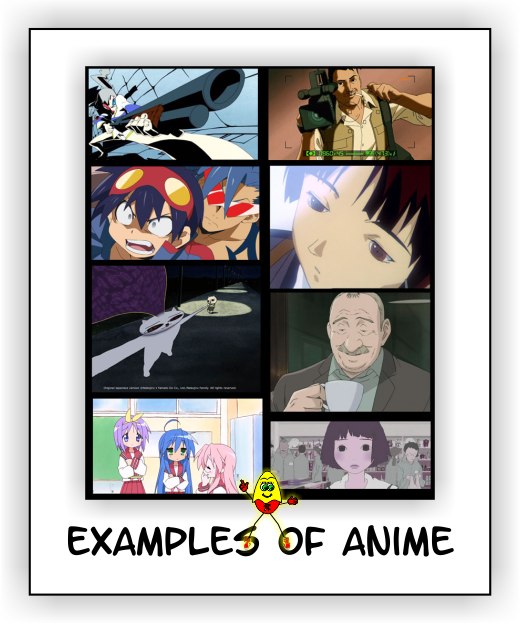 An “Internet meme” is an idea, a symbol or a style that spreads from person to person through the Internet. 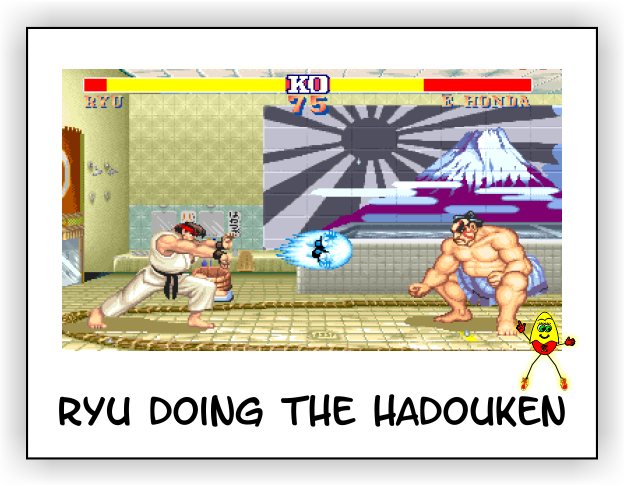 Street Fighter is a very popular Japanese video fighting game from 1987 featuring a martial arts expert named Ryu. 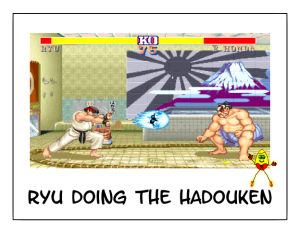 One of the “special attacks” he uses in the game is called Hadouken. 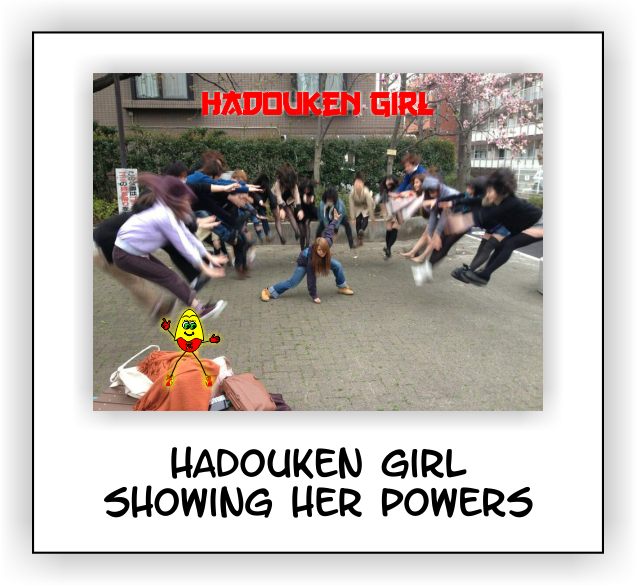 Hadouken or some spell it as Hadoken means “surge fist” or “wave motion fist” in Japanese. It is a very powerful move in the Street Fighter game and is achieved by pressing a combination of buttons on the game’s controller. Sometimes it comes out as a fireball. Makankosappo, literally means “Demonic Piercing Light Murder Gun” in Japanese. It is the name of the “special attack” from the Dragon Ball anime series. 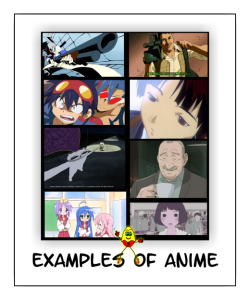 Anime is a Japanese animation style often characterized by huge eyes, colourful graphics, vibrant characters and fantastic themes. While you are reading this, there is an even newer thing or fad or meme called “Vadering“. In the photographs one person is using Darth Vader’s force grip, while the other is floating in mid-air holding their throat. Some say that it just might be clever marketing. What do you think? Write a comment below. Tomorrow you might come up with a new meme and be the new gangnam style guy. Read our article about PSY by clicking here. 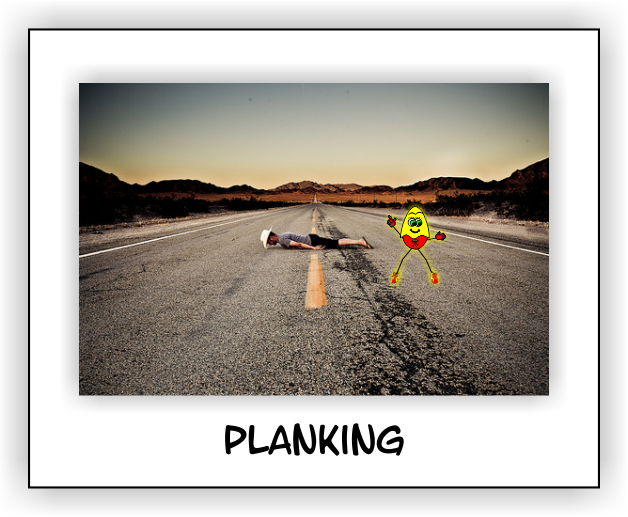 Remember a few years ago there was “Planking“. Also known as the Lying Down Game, where the subject or subjects are lying face down in an unusual location. 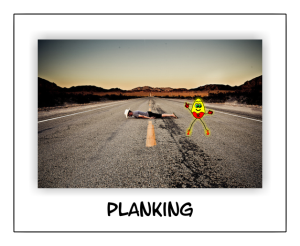 Both hands must touch the sides of the body, like a plank. 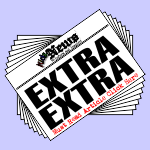 ← Get off your butts and go find a treasure!